Jamie Proctor is desperate to be involved when Rotherham take on his former club Bolton on Saturday. 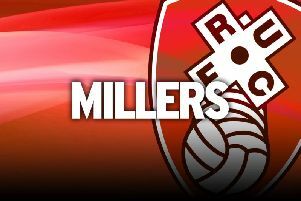 The striker, who is expected to be fit after a two-week lay-off with a groin injury, joined the Millers from the Trotters in the summer of 2017 for £75,000. He has not had it all his own way at the AESSEAL New York Stadium as this latest stint in the treatment room comes just months after he returned from a year-long absence with a serious knee injury. Proctor, fresh from signing a new long-term contract last week, has returned to training ahead of the resumption of the Championship and is eyeing a place in Paul Warne's squad for a game the Millers will be looking to get some points from. “Personally for me playing against any of your old clubs is always good so if I can be involved that will be a big bonus for me,” the 26-year-old said. “But it is about the team and Bolton have started to drop a few points lately but they have had a strong start to the season so it will be a tough game. Proctor moved to South Yorkshire after a frustrating season at the Macron Stadium where he struggled to displace Gary Madine in the starting line-up and ended up going on loan to Carlisle. There are no hard feelings ahead of the reunion, though. “It is a tough one really, it was disappointing in the way that I did not play as many games as I would have liked, but that was due to the form of Gary Madine,” he accepted. “We were playing one up front and Gaz was playing really well and there wasn't much I could do about it to be honest. “It would be the same for me, if I was in the team playing well every week then I wouldn't expect to come out of it. “That was the case, the team were doing really well, they got promoted that season, so the team never changed really. Proctor might have to compete with Josh Kayode for a place in the squad after the young striker was recalled from his loan spell at Chesterfield, where he made three appearances. Defender Clark Robertson could also be involved after he stepped up his recovery from a groin injury by playing for the reserves in midweek. Warne will monitor his returning internationals as they begin to report back, with Kyle Vassell, Marek Rodak and Semi Ajayi all in action for their countries over the last week.